Household chores are a fact of life in most families. Kids get assigned daily, weekly, and monthly tasks appropriate for their age, and by doing them learn responsibility and how to take care of themselves and their home. Few like doing chores, though. Ensure they get done and with the least amount of reminding by making the work—it is work, after all—more fun. These ideas and checklists will help. Just as kids have different interests and hobbies, they also have preferences when it comes to chores. A swimmer might want to be in charge of skimming the pool each day, while a kid with a favorite TV show might want to tidy the living room while watching. 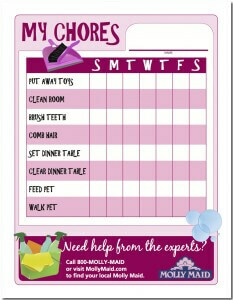 List all of the household tasks on a whiteboard, and then give each child a chance to pick a chore. Choose in order of age the first time. After that, allow those who get their work done without a reminder to jump ahead of older siblings who need an extra nudge or two. 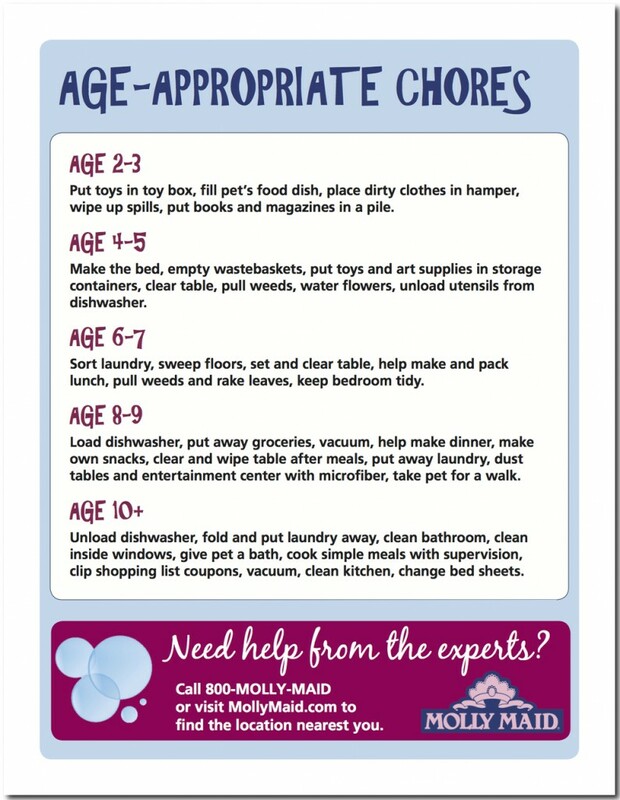 Of course, kids should only be allowed to pick chores they are old enough to do safely. Putting toys away, for example, would be appropriate for a 3-year-old, while unloading the dishwasher or helping with dinner better suits a kid with more advanced motor skills. Many families have chore time on the weekends, with everyone pitching in to put the house back together after a busy week. Get the kids motivated to tackle their tasks by playing a chores soundtrack. Put upbeat songs they will sing and dance to on a playlist, and then blare it from a central location. Creating the chores soundtrack for the next week can even be a reward for the child who finished first. Many parents provide further motivation to complete chores in the form of cash or other rewards. This also serves as a teaching opportunity, with kids learning the value of money and the importance of having a strong work ethic. Make it clear, though, that the chores are not optional. The money or rewards are just that: a reward, not payment for services. Otherwise, a child might decide he or she does not need the money a particular week and skip the work. When it comes to rewards, they can be anything that requires permission but not money, from additional online time to a sleepover with friends, to getting to choose a special dinner for the week. Once the chores are set, the music picked and the benefits decided, use a chart to help keep track of the assignments and their completion. No matter which chart gets used, up the fun factor even more by using colorful stickers or stamps to check off completed tasks. Such tracking also allows parents to quickly and easily see which kids are getting their work done and which are not. For your home cleaning needs, call the professionals at Molly Maid. Call(800) 654-9647 now to connect directly with your local Molly Maid. Each maid services team comprises insured, licensed and uniformed housekeepers who are regularly quality checked. Click here to request service in your area.